Wider, reclaimed wood and wood-like porcelain floors. Wood floorboards are getting wider – often up to 5 and 6 inches, stained warm gray and cut from several tree species. Porcelain flooring has become more popular because it’s indestructible and available in unlimited styles, sizes and colors. Simpler cabinets, bigger drawers. A major shift is occurring in kitchen cabinets with warmer gray tones replacing oranges and browns. Styles have shifted from traditional and detailed to more transitional and mid-century modern. Cleaner designs give a kitchen a more timeless look. Hardware is less visible. Instead of lower cabinets, big drawers give easy access and can be fitted with removable storage containers. Soft blue walls at 199 Presidents Road in Bourne. Paint palettes. Gray, especially warmer hues are “it” in home design this year. The overall look is lighter, fresher – soft corals, shell colors, sea greens, lavenders and misty blues – sometimes with more potent purples and metallics. 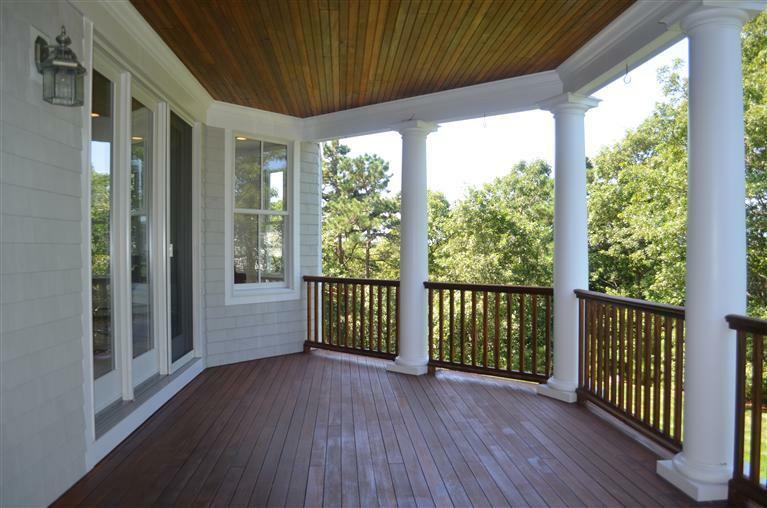 The covered porch at 46 Equestrian Lane in Falmouth. Indoor-outdoor living. Blend indoor and outdoor spaces with multiple sets of French doors that open to the outside and large windows that bring in the outdoors visually. Look for solariums, and screened or covered porches that link the house to the patio or pool. Kitchens. After years of playing it safe in color in appliances, some home owners are willing to go bold. Instead of a desk, homeowners are shifting to smaller work areas for recharging portable devices as well a space to leave mail and keys. New materials like metal such as hot rolled steel are replacing granite. The mismatched, unfitted look is being replaced by cabinets that fit together like a jigsaw puzzle and reflect a cleaner look. Bathrooms. Bathrooms are becoming more luxurious. Look for TV’s integrated into medicine cabinets, bigger steam showers – sometimes 7 feet by 4 feet, and rain heads and dual controls allowing two to shower at once are replacing multiple jets and sprays. Technology. Technology systems are being integrated more and more at all price ranges and complexities: heat to lighting, security to sound and entertainment, and window and window treatments to doors. Global style. Look for more ethnic fabrics and handcrafted artworks mixed into traditional, transitional and modern spaces, particularly African and Asian pieces. Personalized quality. After years of tight budgets, there’s a return to quality as consumers spend more on choice pieces. Accent chairs. The big, comfortable sofa stays, but is complimented by accent chairs for an extra pop of color. Just make sure they’re in the same scale as the other furnishings. This entry was posted in Friday Facts and tagged Cape Cod Real Estate, interior design, interior design trends, real estate facts, real estate tips, real estate trends, remodeling, remodeling additions, remodeling trends, renovations, selling tips, smart home investments. Bookmark the permalink. You’ve shared examples of good design. I liked the variety of colors in the living room. All nice, but the living room more beautiful. Thanks for design ideas.